Is Volatility of Volatility Increasing? Last Wednesday, the SP500 index went down by just -1.8%, but in the volatility space it felt like the world was going to end; the volatility term structure, as measured by the VIX/VXV ratio, reached 1, i.e. the threshold where it passes from the contango to backwardation state. 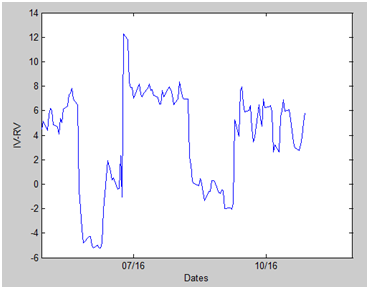 The near inversion of the volatility term structure can also be seen on the VIX futures curve (although to a lesser degree), as shown below. With only -1.8% change in the underlying SPX, the associated spot VIX went from 10.65 to 15.59, a disproportional increase of 46%. The large changes in the spot and VIX futures were also reflected in the prices of VIX ETNs. For example, SVXY went down by about 18%, i.e. 9 times bigger than the SPX return. We note that in normal times SVXY has a beta of about 3-4 (as referenced to SPY). 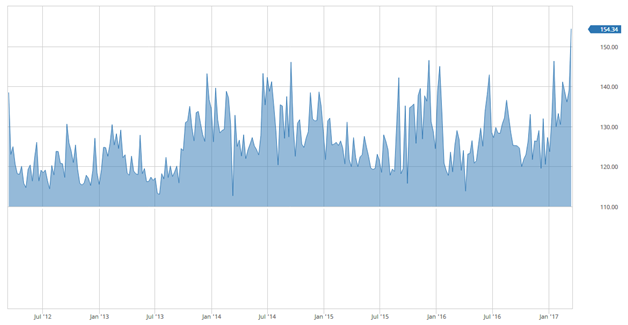 So was the spike in volatility normal and what happened exactly? To answer these questions, we first looked at the daily percentage changes of the VIX as a function of SPX returns. The Figure below plots the VIX changes v.s. SPX daily returns. Note that we plotted only days in which the underlying SPX decreased more than 1.5% from the previous day’s close. The arrow points to the data point of last Wednesday. A cursory look at the graph can tell us that it’s rare that a small change in the underlying SPX caused a big percentage change in the VIX. To quantify the probability, we counted the number of occurrences when the daily SPX returns are between -2.5% and -1.5%, but the VIX index experienced an increase of 30% or greater. The data set is from January 1990 to May 19 2017, and the total sample size is 6900. There are only 11 occurrences, which means that volatility spikes like the one of last Wednesday occurred only about 0.16% of the time. So indeed, such an event is a rare occurrence. Table below presents the dates and VIX changes on those 11 occurrences. But what happened and what caused the VIX to go up that much? 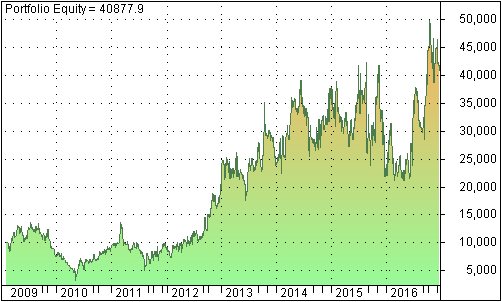 While accurate answers must await thorough research, based on other results (not shown) and anecdotal evidences we believe that the rise in the popularity of VIX ETNs, and the resulting exponential increase in short interest, has contributed greatly to the increase in the volatility of volatility. We also note that from the Table above, out of the 11 occurrences, more than half (6 to be precise) happened after 2010, i.e. after the introduction of VIX ETNs. With an increase in volatility of volatility, risk management became more critical, especially if you are net short volatility and/or you have a lot of exposure to the skew (dGamma/dSpot). Author rvarbPosted on May 22, 2017 May 22, 2017 Categories volatility arbitrage7 Comments on Is Volatility of Volatility Increasing? Last week the VIX index was more or less flat, the contango was favorable, and yet VIX ETF such as XIV, SVXY underperformed the market. In this post we will attempt to find an explanation. Using the above equation, and using the VIX index for σ0,t , VXV for σ0,T, we obtain the 1M-3M forward volatility as shown below. Graph below shows the prices of VXX (green and red bars) and VIX April future (yellow line) for approximately the same period. Notice that their prices have increased since mid February, along with the forward volatility, while the spot VIX (not shown) has been more or less flat. If you define the basis as VIX futures price-spot VIX, then you will observe that last week this basis widened despite the fact that time to maturity shortened. In summary, VIX futures and ETF traders should pay attention to forward volatilities, in addition to the spot VIX. 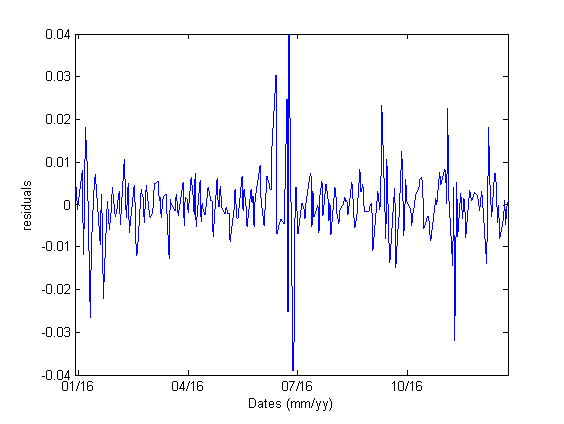 Forward and spot volatilities often move together, but they diverge from time to time. The divergence is a source of risk as well as opportunity. A summary of the systems developed based on the first 2 risk premia was published in this post. In this article, we will attempt to build a trading system based on the third type of risk premium: volatility skew. As a measure of the volatility skew, we use the CBOE SKEW index. The CBOE SKEW Index (“SKEW”) is an index derived from the price of S&P 500 tail risk. Similar to VIX®, the price of S&P 500 tail risk is calculated from the prices of S&P 500 out-of-the-money options. SKEW typically ranges from 100 to 150. 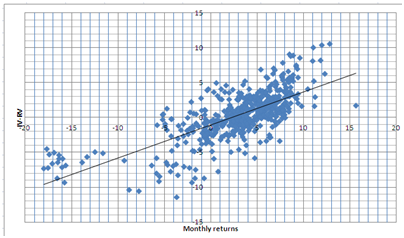 A SKEW value of 100 means that the perceived distribution of S&P 500 log-returns is normal, and the probability of outlier returns is therefore negligible. As SKEW rises above 100, the left tail of the S&P 500 distribution acquires more weight, and the probabilities of outlier returns become more significant. 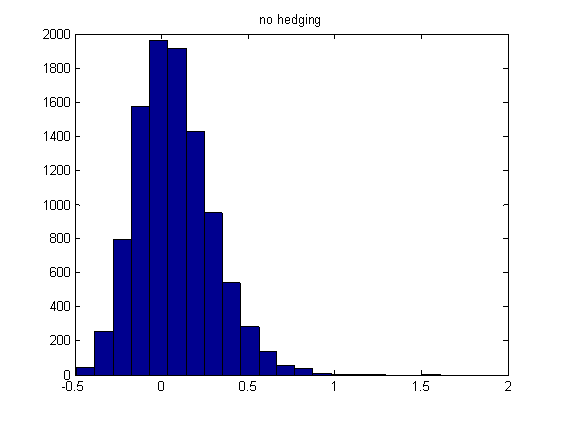 One can estimate these probabilities from the value of SKEW. Since an increase in perceived tail risk increases the relative demand for low strike puts, increases in SKEW also correspond to an overall steepening of the curve of implied volatilities, familiar to option traders as the “skew”. We observe that this system does not perform well as the other 2 systems . A possible explanation for the weak performance is that VXX and other similar ETFs’ prices are affected more directly by the IV/RV relationship and the term structure than by the volatility skew. Hence using the volatility skew as a timing mechanism is not as accurate as other volatility indices. In summary, the system based on the CBOE SKEW is not as robust as the VRP and RY systems. Therefore we will not add it to our existing portfolio of trading strategies. We also tested various combinations of this system and results lead to the same conclusion. The article refers to a well-known phenomenon that under normal market conditions, the VIX and SP500 indices are negatively correlated, i.e. they tend to move in the opposite direction. However, when the market is nervous or in a panic mode, the VIX/SP500 relationship can break down, and the indices start to move out of whack. In this post we revisit the relationship between the SP500 and VIX indices and attempt to quantify their dislocation. Knowing the SP500/VIX relationship and the frequency of dislocation will help options traders to better hedge their portfolios and ES/VX futures arbitrageurs to spot opportunities. 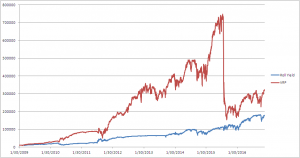 We first investigate the correlation between the SP500 daily returns and change in the VIX index . The graph below depicts the daily changes in VIX as a function of SP500 daily returns from 1990 to 2016. 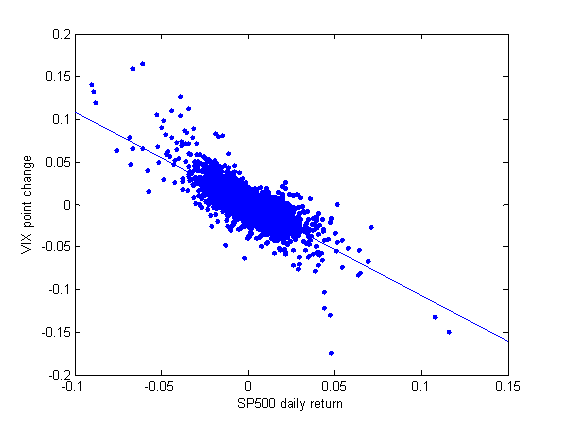 We observe that there is a high degree of correlation between the daily SP500 returns and daily changes in the VIX. We calculated the correlation and it is -0.79 . We next attempt to quantify the SP500/VIX dislocation. To do so, we calculated the residuals. The graph below shows the residuals from January to December 2016. Under normal market conditions, the residuals are small, reflecting the fact that SPX and VIX are highly (and negatively) correlated, and they often move in lockstep. However, under a market stress or nervous condition, SPX and VIX can get out of line and the residuals become large. We observe that the absolute values of SP500/VIX residuals exceed 1% about 17.6% of the time. This means that a delta-neutral options portfolio will experience a daily PnL fluctuation in the order of magnitude of 1 vega about 17% of the time, i.e. about 14 times per year. The dislocation occurs not infrequently. The Table also shows that divergence greater than 2% occurs less frequently, about 3.8% of the time. This year, 2% dislocation happened during the January selloff, Brexit and the US presidential election. 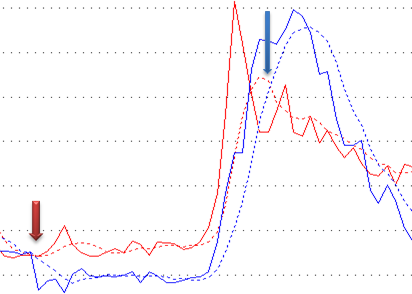 Most of the time this kind of divergence is unpredictable. It can lead to a marked-to-market loss which can force the trader out of his position and realize the loss. So the key in managing an options portfolio is to construct positions such that if a divergence occurs, then the loss is limited and within the allowable limit. We note that under different contexts, the percentage change in VIX can be used in a correlation study. In this post, however, we choose to use the change in the VIX as measured by daily point difference. We do so because the change in VIX can be related directly to Vega PnL of an options portfolio. The scope of this post is not to study the predictability of the linear regression model, but to estimate the frequency of SP500/VIX divergence. Therefore, we applied linear regression to the whole data set from 1990 to 2016. For more accurate hedges, traders should use shorter time periods with frequent recalibration. In previous posts, we presented 2 volatility trading strategies: one strategy is based on the volatility risk premium (VRP) and the other on the volatility term structure, or roll yield (RY). In this post we present a detailed comparison of these 2 strategies and analyze their recent performance. We observe that RY produced less trades, has a lower annualized return, but less drawdown than VRP. 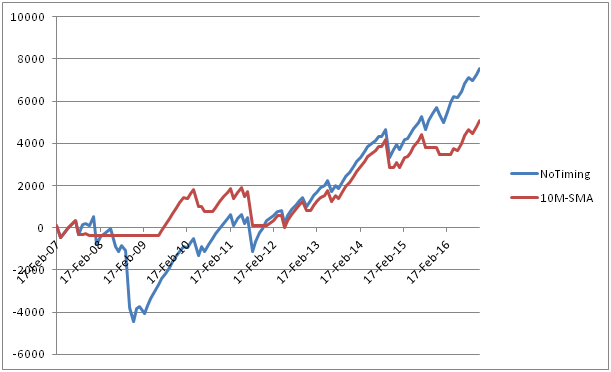 The graph below depicts the portfolio equities for the 2 strategies. It is seen from the graph that VRP suffered a big loss during the selloff of Aug 2015, while RY performed much better. In the next section we will investigate the reasons behind the drawdown. The graph below depicts the 10-day HV of SP500 (blue solid line), its 5-day moving average (blue dashed line), the VIX index (red solid line) and its 5-day moving average (red dashed line) during July and August 2015. As we can see, an entry signal to go short was generated on July 21 (red arrow). The trade stayed short until an exit signal was triggered on Aug 31 (blue arrow). The system exited the trade with a large loss. The reason why the system stayed in the trade while SP500 was going down is that during that period, the VIX was always higher than 5D MA of 10D HV. This means that 10D HV was not a good approximate for the actual volatility during this highly volatile period. Recall that the expectation value of the future realized volatility is not observable. This drawdown provides a clear example that estimating actual volatility is not a trivial task. By contrast, the RY strategy was more responsive to the change in market condition. It went long during the Aug selloff (blue arrow in the graph below) and exited the trade with a gain. The responsiveness is due to the fact that both VIX and VXV used to generate trading signals are observable. 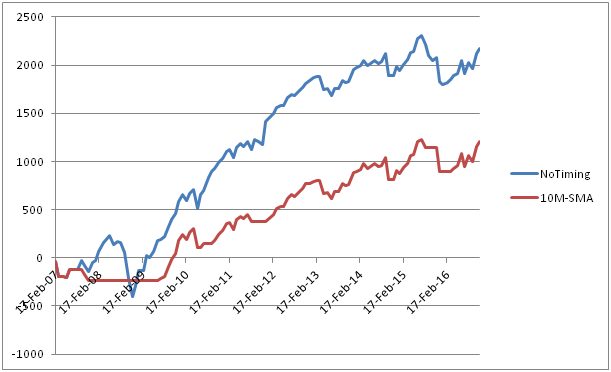 The graph below shows VIX/VXV ratio (black line) and its 5D moving average (red line). In summary, we prefer the RY strategy because of its responsiveness and lower drawdown. Both variables used in this strategy are observable. The VRP, despite being based on a good ground, suffers from a drawback that one of its variables is not observable. To improve it, one should come up with a better estimate for the expectation value of the future realized volatility. This task is, however, not trivial.